ABC’s new summer police drama Motive, returning after a break during the NBA Finals, showed some vital signs in Thursday’s D-FW Nielsens. Motive drew 178,989 viewers in the 8 p.m. hour, easily winning its time slot and ranking as prime-time’s No. 2 most-watched show behind CBS’ 7 p.m. Big Bang Theory repeat (213,410 viewers). Among advertiser-prized 18-to-49-year-olds, Fox’s last summer episode of Does Someone Have to Go? edged Motive at 8 p.m. by a score of 41,462 viewers to 38,273. Fox4’s 9 p.m. local newscast won in both ratings measurements at 9 p.m. The Texas Rangers’ 2-0 afternoon win over New York at Yankee Stadium drew 89,495 total viewers on Fox Sports Southwest while ESPN’s prime-time coverage of the NBA draft averaged 61,958. In Thursday’s local news derby results, WFAA8 swept the 5 and 10 p.m. competitions in both total viewers and 25-to-54-year-olds, the main advertiser target audience for news programming. Fox4 and NBC5 tied for first in total viewers at 6 a.m., with Fox4 narrowly alone at the top among 25-to-54-year-olds. CBS11 had the most total viewers at 6 p.m. while Fox4 ran first in the 25-to-54 demographic. Dallas-based WFAA8 has hired Brian Glenn from Beaumont’s KBTV-TV to report during the morning shift and also contribute to the station’s new 4 p.m. newscast, scheduled for this fall. KBTV says that Glenn “has lived all over the country, residing in Orange County, CA, the Outer Banks of North Carolina and Vero Beach, FL.” He’s married with three children and his favorite color is pink, the station says. Glenn is scheduled to start at WFAA8 in mid-August. Monday’s premiere of Under the Dome gave CBS a hot weather ratings bonanza. Wednesday’s launch of Big Brother’s Season 15 likewise ranked as prime-time’s top TV attraction while performing even better among advertiser-prized 18-to-49-year-olds. BB drew 220,294 D-FW viewers in the 7 p.m. hour, more than doubling the audience for any competing attraction on the Big Four broadcast networks. The 7 to 8 p.m. portion of the Rangers-Yankees game on cable’s Fox Sports Southwest took the runner-up spot with 199,642 viewers. The 18-to-49 crowd for BB -- 121,197 viewers -- was several notches up from the 98,871 drawn by Under the Dome. Rangers-Yankees and Fox’s MasterChef tied for a distant second in that time slot with 57,409 viewers apiece. Three Texans are in this season’s BB mix, with the show also airing on Sundays and Tuesdays. CBS, which topped the regular season ratings race among 18-to-49-year-olds for the first time in 21 years, now is in prime position to also win the summer competition in that key measurement. Among the Big Four nets, CBS also ran first in total viewers from 8 to 10 p.m. with The American Baking Competition and a Criminal Minds repeat. The 18-to-49 wins in those slots went to a second 8 p.m. episode of Masterchef and Fox4’s 9 p.m. local newscast and ABC’s The Lookout (which tied for No. 1). The Rangers’ 6-5 win at New York, which ran until 9:33 p.m., averaged 178,989 total viewers with a peak crowd of 261,600 between 8:45 and 9 p.m. In Wednesday’s four-way local news derby results, WFAA8 edged CBS11 for No. 1 in total viewers at 10 p.m. while winning by a much wider margin among 25-to-54-year-olds (main advertiser target audience for news programming). WFAA8 also swept the 6 p.m. competitions and added a 5 p.m. win in total viewers. Fox4, NBC5 and WFAA8 tied for the most total viewers at 6 a.m., with Fox4 narrowly on top by itself in the 25-to-54 demographic. Fox4 also had the most 25-to-54-year-olds at 5 p.m. Nothing really popped Tuesday. Not even a close Texas Rangers-New York Yankees game with Yu Darvish on the mound. The night’s overall most-watched attraction, CBS11’s syndicated Wheel of Fortune, drew 206,526 D-FW viewers at 6:30 p.m. NBC’s 8 to 10 p.m. chunk of America’s Got Talent was the runner-up with 192,758 viewers. The Rangers’ 4-3 loss to New York, on a walk-off home run by Ichiro Suzuki, averaged just 151,452 viewers on Fox Sports Southwest. The network may well have been expecting nearly twice that crowd, even with an early 6 p.m.-ish start time. Among advertiser-craved 18-to-49-year-olds, America’s Got Talent fared best with 73,356 viewers. In Tuesday’s local news derby results, CBS11 had the most total viewers at 10 p.m. while WFAA8 led among 25-to-54-year-olds, the main advertiser target audience for news programming. Fox4 ran the table at 6 a.m. and NBC5 did likewise at 5 p.m. The 6 p.m. firsts went to NBC5 in total viewers and Fox4 in the 25-to-54 measurement. Absent competition from a Texas Rangers game and opposite the deciding stages of the final Stanley Cup face-off, CBS rode its favorably reviewed premiere of Under the Dome to the ratings top spot Monday. Adapted from Stephen King’s same-named novel, the 9 p.m. launch drew 309,789 D-FW viewers while also ranking No. 1 for the night among advertiser-prized 18-to-49-year-olds (98,871). Game 6 of the Stanley Cup, in which the Chicago Blackhawks ousted the Boston Bruins with two rapid-fire, last ditch goals, averaged 96,379 total viewers on NBC and 110,147 during the climactic 9 to 10 p.m. portion. That ranked the game second during that hour, with ABC’s 9 p.m. episode of Mistresses (68,842 viewers) placing last among the Big Four broadcast networks. The serial soap moved up to third place, ahead of Fox4’s 9 p.m. local newscast, in the 18-to-49 demographic. In Monday’s local news derby results, WFAA8 overcame a substantial lead-in disadvantage to tie CBS11 for first place in total viewers at 10 p.m. The ABC station won outright among 25-to-54-year-olds, the main advertiser target audience for news programming. Fox4 had the most viewers at 6 a.m., but NBC5 topped the 25-to-54 measurement. 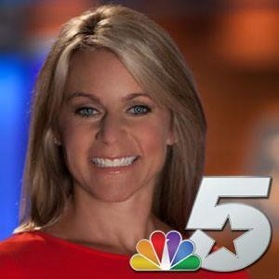 WFAA8 swept the 6 a.m. competitions and Fox4 did likewise at 5 p.m.
Reporter Julie Fine officially is on board at Fort Worth-based NBC5 after announcing her departure from Pittsburgh’s WPXI-TV in late spring. The Tulane University grad spent three years at WPXI, Pittsburgh’s NBC affiliate, after a previous stint at Buffalo’s WKBW-TV. While at WPXI, from where WFAA8 freelance meteorologist Julie Bologna also emigrated, Fine won an Emmy award for her coverage of the firing of Penn State football coach Joe Paterno. A pair of rain delays no doubt deflated the TV attendance, particularly on Sunday night. Still, the Texas Rangers’ three-game sweep at St. Louis controlled D-FW’s weekend ratings. Three different outlets benefited from the Rangers’ rebound back into first place ahead of Oakland. Friday’s game on TXA21 averaged 234,063 viewers in squashing all prime-time competition. Fox’s Saturday game, delayed for an hour by rain, drew 213,410 viewers opposite NBC’s Game 5 of the Blackhawks-Bruins Stanley Cup Finals (48,189 viewers). ESPN had the Sunday night game, which didn’t start until just after 10 p.m. because of rain. It still managed 130,800 viewers in easily beating all other late night programming. ABC’s 8 p.m. premiere of Whodunnit? likewise had 130,800 viewers in the 8 p.m. hour Sunday, outdrawing NBC’s two-hour opening episode of Crossing Lines (110,147 viewers from 8 to 10 p.m.). Whodunnit? also had the edge with advertiser-prized 18-to-49-year-olds. Ratings for Lifetime’s premiere of Devious Maids and AMC’s season finale of Mad Men were not immediately available. WFAA8 ran the table at 10 p.m., winning in both total viewers and 25-to-54-year-olds, the main advertiser target audience for news programming. The ABC station added a 6 p.m. win in total viewers and a 5 p.m. first with 25-to-54-year-olds. CBS11 had the most 25-to-54-year-olds at 6 p.m. and NBC5 the most viewers at 5 p.m. Fox4 swept the 6 a.m. competitions. ABC execs are basking in the afterglow of a dynamic 7-game NBA Finals, with Thursday night’s championship match roaring in the D-FW ratings. Running from 8:11 to 10:48 p.m., the Miami Heat’s 95-88 win over the San Antonio Spurs averaged 832,988 viewers, with a peak crowd of 1,101,472 between 10:30 and 10:45 p.m. Even more important to ABC and the NBA, Game 7 averaged 491,168 viewers in the advertiser-prized 18-to-49 range, peaking at 628,312 in the 10:30 to 10:45 p.m. segment. It’s gold for a network any time a program draws more than 50 percent of its viewers in this key demographic. Mission accomplished Thursday night. Game 7 crushed everything in its wake, including NBC’s 9 p.m. Season 1 finale of Hannibal. It had a starvation diet of 41,305 total viewers with an even measlier 12,758 within the 18-to-49 motherlode. CW33’s 9 p.m. Nightcap (“a different kind of news”) came up completely empty, with no measurable audience in either ratings barometer. On Wednesday, NBC fared a bit better with Game 4 of the Stanley Cup finals between the Chicago Blackhawks and Boston Bruins. Stretching to 10:30 p.m., when the Blackhawks won in overtime, it averaged 68,842 viewers and 38,273 in the 18-to-49 age range. The night’s most-watched TV attraction on the Big Four broadcast networks, CBS’ 7 p.m. episode of the American Baking Championship, drew 185,873 total viewers. The Texas Rangers did a bit better than that on cable’s Fox Sports Southwest, averaging 199,642 viewers for their home win over the first-place Oakland A’s. Thursday afternoon’s game on FSS, also a Rangers win, pulled in 89,495 viewers. Wednesday -- With a hockey run-over on NBC, WFAA8 won a downsized 10 p.m. competition in total viewers while Fox4 ran first with 25-to-54-year-olds (main advertiser target audience for news programming). NBC5 was tops in total viewers at 6 a.m., and tied Fox4 for first among 25-to-54-year-olds. NBC5 and CBS11 respectively had the most viewers at 5 and 6 p.m.; Fox4 took both 25-to-54 golds. Thursday -- ABC’s NBA run-over made it another three-way competition at 10 p.m., with CBS11 running first in both ratings measurements. NBC5 and WFAA8 tied for the most total viewers at 6 a.m., but WFAA8 won outright among 25-to-54-year-olds. Fox4 ran the table at 5 p.m. and added a 6 p.m. win in the 25-to-54 demographic. CBS11 again had the most total viewers at 6 p.m.
ABC’s Game 6 of the NBA Finals took its highest bounce to date in the D-FW Nielsens. That’s what happens when a nail-biting overtime period contrasts with four consecutive blowouts. The Spurs’ late 4th quarter collapse and the victorious Heat’s frantic rally to force OT ran all the way to 11:13 p.m. after a bit later than usual 8:11 p.m. start. It averaged 674,652 total viewers in easily wiping out the Game 5 high of 516,315. Game 6 also set a new mark among advertiser-prized 18-to-49-year-olds, with 379,539 viewers in this age range. That obliterated the Game 4 total of 283,857, which had been the biggest haul to date. Game 6’s peak audience came in the closing minutes, when just shy of a million viewers -- 991,325 -- were tuned in. The 18-to-49 audience totaled 570,903 during that same segment Tuesday. Look for the climactic Game 7 Thursday night on ABC. On any other night, NBC’s 8 to 10 p.m. season finale of The Voice would have been prime-time’s ratings champ. It still had big numbers, with 447,473 total viewers and 207,311 in the 18-to-49 motherlode. The Peacock won the 7 p.m. hour with America’s Got Talent, which drew 268,484 viewers with 111,629 in the 18-to-49 zone. On Fox Sports Southwest, the Texas Rangers’ lackluster loss to the first-place Oakland A’s averaged 165,221 total viewers. In Tuesday’s have-not ratings, KTXD-TV’s (Ch. 47) D: The Broadcast continued to go unnoticed from 9 to 11 a.m. It had “hashmarks” (no measurable audience) in all ratings barometers. The station’s highest scorer, a 3:30 p.m. repeat of Adam 12, drew 27,537 viewers. NBC5 won a downsized three-way 10 p.m. competition in both total viewers and 25-to-54-year-olds, the main advertiser target audience for news programming. Fox4 remained solidly atop the 6 a.m. Nielsens with twin wins while NBC5 swept the 5 p.m. competitions and added a 6 p.m. first among 25-to-54-year-olds. WFAA8 had the most viewers at 6 p.m.
NBC dominated Monday among the Big Four broadcast networks with its final performance edition of this season’s The Voice and yet another hour of apprentice singing on The Winner Is. The Texas Rangers also rediscovered their bats and ratings power with a badly needed 8-7 win over first-place Oakland. The Voice commanded the 7 to 9 p.m. slot with 399,284 D-FW viewers and 169,038 of them in the advertiser-coveted 18-to-49 demographic. Rangers-Oakland, which ended at 10:13 p.m. on cable’s Fox Sports Southwest, then took over the last hour of prime-time with 268,484 total viewers while The Winner Is called the tune among broadcast networks with 158,337 viewers. 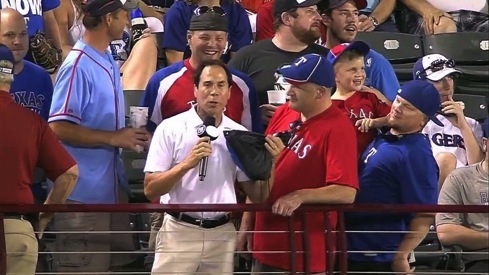 The Rangers also won the 9 to 10 p.m. slot among 18-to-49-year-olds, with 95,682 viewers in this age range. Winner Is had 66,977 to lead the broadcasters. The Rangers overall averaged 206,526 total viewers, with a peak TV crowd of 344,210 on hand for closer Joe Nathan’s scary save in the 9th. Texas had been on a ratings respirator for the team’s pitiful weekend series against Toronto, with both the Saturday and Sunday games drawing fewer than 90,000 viewers. Prime-time’s biggest loser Monday was CW33’s comedy-laced 9 p.m. Nightcap newscast, which had 2,065 total viewers and “hashmarks” (no measurable audience) among 18-to-49-year-olds. Fox also continued its summertime struggles. The network’s most-watched prime-time attraction, a new 7:30 p.m. episode of Goodwin Games, had 61,958 total viewers. Fox4’s 9 p.m. local newscast, fed a piddling 20,653 viewers from the last 15 minutes of Anger Management, pole-vaulted to 103,263 viewers in finishing second among the Big Four broadcasters opposite CBS’ Hawaii Five-0 repeat (89,495) and a new hour of ABC’s Mistresses (75,726). WFAA8 won at 10 p.m. in total viewers but Fox4 reigned among 25-to-54-year-olds, the main advertiser target audience for news programming. Fox4 ran the table at both 6 a.m. and 5 p.m. while adding a 6 p.m. first in the 25-to-54 demographic. WFAA8 had the most viewers at 6 p.m.
Game 5 of the NBA Finals, with the Spurs taking a 3-2 lead on the Heat, hit the highest audience level to date in D-FW. Surpassing the half-million mark for the first time, San Antonio’s 10-point win over Miami on ABC averaged 516,315 viewers with a peak crowd of 715,957 from 9:30 to 9:45 p.m. That beat the previous high of 495,662 viewers for last Thursday’s Game 4. The game fell off with advertiser-prized 18-to-49-year-olds, though, averaging 232,826 viewers in this age range. That’s the first time that more than half the overall audience wasn’t within this key demographic. Game 4 had the most 18-to-49-year-olds -- 283,857. The Miss USA pageant on NBC ranked as Sunday’s second most-watched attraction opposite the NBA Finals, luring 117,031 total viewers. Earlier Sunday on NBC, the final round of the U.S. Open averaged a decent-sized 192,758 viewers, peaking at 275,368 between 6:15 and 6:30 p.m. On Fox Sports Southwest, the cratering Texas Rangers’ latest loss slumped in the ratings as well. The game averaged just 75,726 viewers, one of the lowest turnouts of the season and also one of the few times the actual attendance at the ballpark --- 44,052 -- added up to more than half of the TV audience. Saturday afternoon’s Ranger loss to Toronto had 89,495 viewers. That night’s overtime Game 2 of the Stanley Cup Finals on NBC Sports Net averaged 55,074 viewers with a high point of 75,726 for the action-packed OT period in which the Boston Bruins evened the series with the Chicago Blackhawks. TXA21’s weekly Friday night Rangers game, another loss, had the biggest TV audience of the weekend with 165,221 viewers. That tied CBS’ Blue Bloods rerun for prime-time’s most-watched program. CBS11 won at 10 p.m. in total viewers while Fox4 nipped WFAA8 for the top spot among 25-to-54-year-olds, the main advertiser target audience for news programming. Fox4 again swept the 6 a.m. competitions and likewise ran the table at 5 p.m. The 6 p.m. wins went to CBS11 in total viewers and Fox4 in the 25-to-54 demographic. WFAA8 sports anchor Dale Hansen’s “Backyard Party,” supposedly retired three years ago, is back in play for a worthy cause, City House. To un-retire it, he’s enlisted the king of the un-retirers -- as you’ll see in the video below. The party is on Saturday, June 15th. And it literally is in Hansen’s sprawling Waxahachie backyard. You can find more information here on tickets, time and location. Although it resulted in another double-digit win -- this time for Miami -- Game 4 of the NBA Finals hit the highest point so far in D-FW. The Heat’s 16-point win at San Antonio, evening the series at 2-2, ran until 10:40 p.m. and averaged 495,662 viewers. That tops the crowd for Game 2, which had been No. 1 with 468,126 viewers. Game 4 also pulled in the most advertiser-prized 18-to-49-year-olds, averaging 283,857. The Texas Rangers’ home loss to Toronto, even with ratings magnet Yu Darvish on the mound, was no match at all. It had 165,221 total viewers on Fox Sports Southwest. On Wednesday night, NBC’s marathon Game 1 of the Stanley Cup Finals between the Chicago Blackhawks and Boston Bruins averaged 68,842 viewers. That made it an overall fifth among the Big Four broadcast networks and FSS’s Rangers game, which ranked as prime-time’s top draw with 172,105 viewers. Wednesday -- WFAA8 and CBS11 tied for first at 10 p.m. in total viewers but Fox4 won among 25-to-54-year-olds, the main advertiser target audience for news programming. Fox4 again swept the 6 a.m. competitions while adding 5 and 6 p.m. wins in the 25-to-54 demographic. WFAA8 had the most viewers at 5 p.m. by a paper-thin margin over Fox4. CBS11 nipped WFAA8 for the most viewers at 6 p.m.
Thursday -- The spoils were divided in a down-sized three-way 10 p.m. face-off, with CBS11 winning in total viewers and Fox4 tops with 25-to-54-year-olds. The 6 p.m. golds went to CBS11 in total viewers and WFAA8 in the 25-to-54 demographic. At 5 p.m., NBC5 and WFAA8 tied for first in total viewers, with WFAA8 winning outright among 25-to-54-year-olds. Not all that much was expected. But still . . .
WFAA8’s Thursday 6 p.m. newscast devoted all of 21 seconds to the sale of itself and 19 other Belo Corp.-owned television stations. It followed five other stories at the 6:05 p.m. mark of a newscast that begins a minute or so ahead of the appointed hour in order to get a jump on the competition. Co-anchor Shelly Slater did the deed, telling viewers that Virginia-based Gannett Co. Inc.’s big buy of Dallas-based WFAA8 and the other Belo TV holdings will create a “broadcast super group” of 43 stations nationwide. That was straight from a joint news release by the two corporations. “The deal should be closed by the end of the year,” she said. End of story. A few minutes later, Curly the missing Fair Park macaw received roughly the same amount of air time. Envision the top-of-the-newscast “team coverage” had this been another major Dallas-based entity selling itself to an outsider. But on WFAA8, no mention was made of the station’s 63-year history as a locally owned TV station. Or of the fact that when this deal is done, all of D-FW’s major TV news outlets will for the first time ever be owned from afar. WFAA8’s principal rivals, Fox4, NBC5 and CBS11, are the properties of their namesake networks. The purchase of WFAA8 wasn’t exactly a blip on the news radar. It set off some seismic shocks locally, with the station’s former synergistic pal, The Dallas Morning News, devoting two front page stories to the out-of-the-blue deal while The New York Times played the story on the front page of its “Business Day” section. Current WFAA8 employees are being strongly advised not to talk about the sale of their station. But veterans Dale Hansen and Gloria Campos, whom WFAA8 hired as D-FW’s first Hispanic anchor, were both willing to comment. “I think it’s another sign from the universe that it’s my time to leave,” said Campos, who signed an 18-month contract extension in May of last year and is now a WFAA8 part-timer who co-anchors the 10 p.m. newscasts with John McCaa. Her agreement runs through the end of February 2014, at which point Gannett expects to be the FCC-approved new owner of WFAA8. 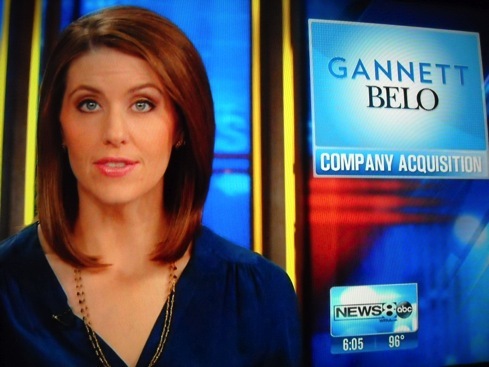 WFAA8 newsroom staffers were informed of the Belo-Gannett deal via email Thursday. No one apparently had any inkling of it. “I had never ever remotely heard the slightest rumors about any of it,” said longtime sports anchor Hansen, who still has three-and-a-half years left on what likely will be his final contract with WFAA8. 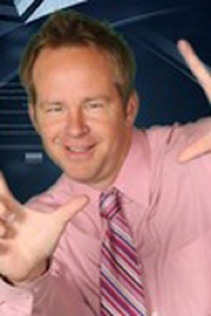 Former WFAA8 stalwarts also weighed in after being contacted by unclebarky.com. As detailed in a previous post, the station has a tradition-rich history and a longstanding reputation for excellence in news coverage. Rowlett was hired in 1974 from an Oklahoma City TV station by Marty Haag, the late news director credited with turning WFAA8 into a news powerhouse both locally and nationally. Troy Dungan, WFAA8’s longtime weathercaster until retiring in 2007, said that Thursday’s sale was “certainly sad in a way for those of us with a connection to the long and gloried history of Belo broadcasting.” But he’s also concerned about his pension. Former WFAA8 reporter Chris Heinbaugh covered City Hall for the station until resigning in 2007 to become Mayor Tom Leppert’s chief of staff. The Gannett purchase may be more a sign of the times than an upheaval. The overriding idea is that bigger television groups have more leverage and influence in times when profits are at a premium in a far-flung media universe. It’s anyone’s guess -- or opinion -- whether current WFAA8 leadership, headed by president and general manager Mike Devlin and news director Carolyn Mungo, will survive the expected transition to Gannett ownership early next year. And at least five of the sold Belo stations in effect will become subsidiaries in markets where Gannett already owns a TV property. In St. Louis, for instance, NBC affiliate KSDK-TV is owned by Gannett and CBS affiliate KMOV-TV is owned by Belo. Because of government rules prohibiting ownership of two TV stations in the same market, the Belo stations will be leased under a “shared services arrangement” in which a so-called independent operator runs them while still pooling resources with the existing Gannett-owned stations. The Dallas Morning News reported Friday that ex-Belo executive Jack Sander would be the owner and operator of the five stations in markets where both Belo and Gannett cross paths. In the New York Times story on the Gannett-Belo deal, the public interest group Free Press slams the pending partnership between the St. Louis NBC and CBS stations. “This increasing concentration of ownership -- coupled with covert consolidation that combines formerly competing newsrooms -- is failing local communities,” Free Press says. 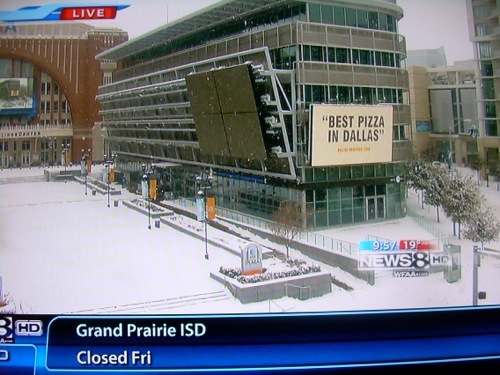 Don’t expect to hear any other sides of the story on WFAA8, though. The station’s 21-second “coverage” Thursday is testament to that. 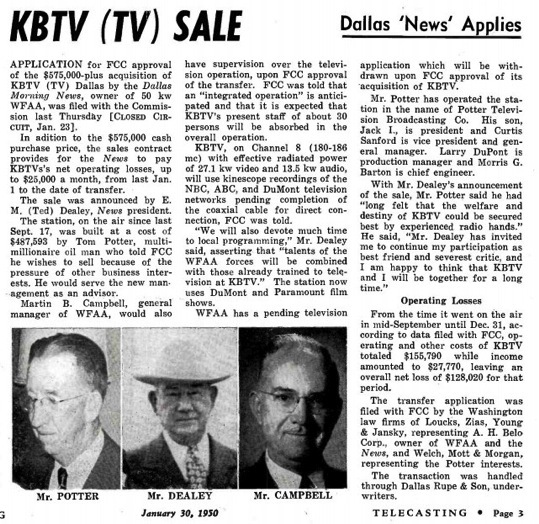 Let history show that Belo initially bought KBTV-TV in 1950, eventually re-naming it WFAA-TV. This newspaper story from those times, courtesy of reader Chris Huff, speaks volumes about both the origins of TV and the good ol’ “bidnessmen” who called the tunes. Check out that pork pie cowboy hat on E.M. (Ted) Dealey. Note also that the purchase price was $575,000. And that the original owner, Potter Television Broadcasting Co., reported a net loss of $128,020 during its brief stewardship of the future WFAA-TV. WFAA8, the last remaining, locally owned major TV station in the Dallas-Fort Worth market, is allowing that ship to sail with Thursday’s out-of-the-blue announcement of a $1.5 billion sale to Gannett Co., Inc. by Belo Corp. Pending regulatory approval, likely by the end of this year, the big buy will increase Gannett’s total of TV stations from 23 to 43, reaching nearly one-third of the country’s U.S. households, according to a news release. Gannett terms it a broadcast “Super Group.” Dallas-based Belo Corp.’s TV holdings currently include its tradition-rich flagship station, ABC affiliate WFAA8, and TV stations in Houston, Austin and San Antonio. Gannett also has considerable newspaper holdings, including USA Today, The Arizona Republic and The Cincinnati Enquirer. Belo is still in the newspaper game, but as a different entity after spinning off its non-TV properties in 2008 into a company called A.H. Belo. The Dallas Morning News, founded in 1885, remains its crown jewel, although some expect the other shoe could drop after the stunning sale of Belo Corp.’s 20 TV stations. The Belo buying spree came before WFAA8’s principal rivals in D-FW -- KDFW-TV, KXAS-TV and KTVT-TV -- were bought by the networks who also furnished their programming. KDFW became the property of Fox in 1995, switching from a CBS to Fox lineup in the process. KXAS was bought by NBC in 1998; KTVT, formerly a non-network independent, went under the ownership of CBS in 1999. The latter purchase coincided with the jump of WFAA8’s longtime mainstay anchor, Tracy Rowlett, to a post as the new face of KTVT’s newscasts. The rapid-fire sales of those three stations left WFAA8 as the market’s only mom-and-pop major player, even though Belo also had 19 other TV stations in its domain by then. WFAA8, under the new anchor team of Rowlett and Iola Johnson, became a dominant force in the local newscast ratings during the mid-1970s. Both now make regular appearances on KTXD-TV’s (Ch. 47) The Texas Daily, which launched on Oct. 1st of last year as a conversation-driven news program aimed at baby-boomers. The station is loaded with former WFAA8 stars, with Troy Dungan, John Criswell, Midge Hill and Gary Cogill also part of the rotating Texas Daily lineup. The purchase of WFAA8 by Gannett comes at a time when stalwarts such as Gloria Campos, John McCaa and Dale Hansen all have accepted substantial pay cuts in return for remaining on the air during the waning years of their long careers. In the past two years, a number of experienced anchor/reporters have left WFAA8, voluntarily or otherwise, for new careers outside the TV business. They include Brad Watson, Debbie Denmon (also a part-time player on Texas Daily), Cynthia Vega, Craig Civale, Chris Hawes and Casey Norton. Mostly during the reign of late, legendary news director Marty Haag, WFAA8 became something of a Triple AAA farm system for reporters who went on to make their mark at the network news level. Most prominent among them is Scott Pelley, now anchor of the CBS Evening News and also a 60 Minutes correspondent. WFAA8, under Belo ownership, also hired the D-FW market’s first full-time African-American anchor, Iola Johnson, and the first featured Hispanic anchor, Gloria Campos. The station’s national prominence dates back almost 50 years to its coverage of the Nov. 22, 1963 assassination of President John F. Kennedy. And in a more modern TV news era, WFAA8 received national accolades and exposure on the afternoon of Aug. 2, 1985, when it offered continuous live reporting on the Delta Flight 191 crash at Dallas-Fort Worth International Airport, in which 137 people died. Some rival stations remained with game shows during the early stages of WFAA8’s acclaimed coverage. WFAA8 also excelled with its live coverage, in October 1987, of “Baby Jessica’s” disappearance into a backyard Midland, TX well at the age of 18 months. The dramatic rescue operation of little Jessica McClure, which stretched for more than two days, captured the attention of the nation. WFAA8’s then state-of-the-art satellite truck put the station on top of the story from start to finish while its equipment-deficient D-FW rivals had to piggyback and wait their turn for periodic windows of opportunity. The station still has a solid one-two punch in investigative reporters Byron Harris and Brett Shipp, both of whom have won far more prestigious Peabody and duPont-Colubmbia awards for their work than Fox4, NBC5 and CBS11 combined. Old-line reporters Jim Douglas and George Riba also remain on duty, but WFAA8 otherwise has been changing the face -- and faces -- of its news operation well before the Gannett purchase. We’ll have more on this later. But I’m now off to do some interviews on the impending end of an era. I’ve been covering D-FW television since 1980, and sheer longevity in this marketplace still counts for something on this historic day. The Spurs’ annihilation of Miami in Game 3 of the NBA Finals won the night against tougher competition but also ranked lowest of the trio on the D-FW audience-o-meter. Running until 10:30 p.m., San Antonio’s 36-point victory averaged 419,936 viewers, with 213,690 in the advertiser-craved 18-to-49 motherlode. Game 2, the most-watched to date, had respective totals of 468,126 and 277,478 viewers. Game 1 drew 433,705 viewers, with 264,720 in the 18-to-49 age range. Although the game had been decided, Tuesday’s numbers peaked in the final 15 minutes, with 585,157 total viewers tuned in from 10:15 to 10:30 p.m.
NBC ran second overall, with The Voice logging 289,136 viewers to win the 7 p.m. hour before America’s Got Talent had 247,831 viewers directly opposite Spurs-Heat. On Fox Sports Southwest, the Texas Rangers’ 5-2 home loss to Cleveland drew 158,337 viewers. In a downsized three-way competition, NBC5 had its first 10 p.m. double-header sweep in recent memory. The Peacock ran first in both total viewers and 25-to-54-year-olds, the main advertiser target audience for news programming. Fox4 as usual ran the table at 6 a.m. while WFAA8 swept the 6 p.m. competitions. At 5 p.m., the golds went to WFAA8 in total viewers and NBC5 among 25-to-54-year-olds. NBC continues to enjoy a balmy ratings summer -- even though it’s not quite summer yet. Its latest two-hour edition of The Voice romped from 7 to 9 p.m. Monday with 330,442 D-FW viewers, again squashing ABC’s runner-up The Bachelorette (144,568 viewers in the same time slot). The Voice also sung an aria among advertiser-prized 18-to-49-year-olds. A sneak preview of the Peacock’s latest singing competition -- The Winner Is -- then won at 9 p.m. in total viewers with 144,568. And it ran a close second to ABC’s Mistresses in the key 18-to-49 demographic. At the other end of the teeter-totter, Fox continued to wail the summertime blues. It ran fourth across the board among the Big Four broadcast networks, with its most-watched attraction, an 8:30 p.m. episode of Charlie Sheen’s Anger Management import from FX, drawing just 34,421 total viewers. Fox4’s local 9 p.m. newscast then more than doubled that audience -- to 75,726 viewers -- but still ran fourth in that measurement while tying CBS’ Hawaii Five-0 repeat for third with 18-to-49-year-olds. In the cable universe, the Texas Rangers’ home win against Cleveland had a nice-sized 185,873 total viewers on Fox Sports Southwest. TNT’s Season 2 launch of Major Crimes, followed by the premiere of King & Maxwell, respectively pulled in 137,684 and 82,610 viewers. WFAA8 ran first at 6 and 10 p.m. in both total viewers and 25-to-54-year-olds, the main advertiser target audience for news programming. Fox4 again ran the table at 6 a.m. and also swept the 5 p.m. competitions. Jim “Knoxie” Knox, the Sideshow Bob of Texas Rangers games, kept threatening to rappel off Toronto’s CN Tower during Sunday afternoon’s Fox Sports Southwest presentation. As a matter of fact, yes. Here are highlights of the Twitter give-and-take, with Bob Sturm and Mike Rhyner of “The Ticket” among those chirping in. And there you have it. Let’s do this again some time -- when occasions arise. Miami’s thrashing of San Antonio in Game 2 of the NBA Finals didn’t stop the ratings from flowing. The ABC telecast, a rout that ran until 9:25 p.m., averaged 468,126 viewers. That’s actually better than the 433,705 viewers for Thursday night’s down-to-the-wire win by the Spurs. ABC also again cashed in big among advertiser-prized 18-to-49-year-olds, with more than half the audience -- 277,478 -- in this age range. That likewise exceeded Thursday’s total of 264,720. Opposite the NBA on CBS, the annual Tony Awards never had a chance. The ceremony averaged 130,800 viewers with 25,515 in the 18-to-49 demographic. Sunday night’s runner-up among 18-to-49-year-olds was HBO’s 8 p.m. Season 3 finale of Game of Thrones, which had 79,735 viewers in this age range and 117,031 overall. On Sunday afternoon, the Texas Rangers’ comeback win at Toronto drew 185,873 total viewers on Fox Sports Southwest. Saturday’s marathon 18-inning Rangers-Blue Jays game, which stretched all the way until 5:36 p.m., presented an imposing challenge to Uncle Barky’s hand calculator technology. But adding up each 15-minute segment shows that this game had an overall average of 178,989 viewers, with a peak crowd of 247,831 between 5:15 and 5:30 p.m. The Rangers lost. Friday night’s Rangers loss on TXA21 drew 158,337 viewers, good enough to easily beat all competing prime-time programs. In Friday’s local news derby results, WFAA8 won at 10 p.m. in total viewers while NBC5 ran first among 25-to-54-year-olds, the main advertiser target audience for news programming. Fox4 ran the table at 6 a.m. and the Peacock did likewise at 5 p.m. WFAA8 added another sweep to the proceedings with twin wins at 6 p.m.
ABC’s sleepy prime-time ratings got a big bounce from Thursday’s Game 1 of the NBA Finals. The Spurs’ closely contested win over Miami, with the final buzzer at 10:37 p.m., averaged 433,705 D-FW viewers, with the crowd swelling to 619,578 viewers in the final minutes. Even better for ABC, more than half the overall audience -- 264,720 viewers -- hit the advertiser-prized 18-to-49 motherlode. It was ABC’s biggest night in this key demographic since the Feb. 24th Oscars, which had 430,569 D-FW viewers in the 18-to-49 age range. The Texas Rangers’ road loss to Boston, with reliever Michael Kirkman predictably cratering in the clutch, ranked as Thursday’s prime-time runner-up with 220,294 total viewers. The latter innings of the game, which ended with David Ortiz’s walk-off homer at 9:30 p.m., aired opposite the NBA Finals. Baseball’s audience peaked at 337,326 viewers from 9:15 to 9:30 p.m. Spurs-Heat had 316,673 viewers in that segment, marking the only time the Finals fell short of the Rangers in their 90 minutes opposite each other. Then again, it was halftime. In another telling number, combined viewership for the 10 p.m. newscasts on Fox4, NBC5 and CBS11 fell short of that half-hour of Spurs-Heat by a score of 557,620 to 447,773. CBS11 topped the three-station news field with 199,642 viewers but Fox4 had the most 25-to-54-year-olds (main advertiser target audience for news programming). Fox4 resumed its winning ways by sweeping the 6 a.m. competitions while adding a 5 p.m. double play. WFAA8 won in both ratings measurements at 6 p.m. Facing a Big Four broadcast network equivalent of the Milwaukee Brewers, the Texas Rangers’ 3-2 win at Boston ranked No. 1 overall Wednesday. An early 6:10 p.m. start on Fox Sports Southwest also gave the Rangers a slow start. But the game gradually built to a peak D-FW audience of 282,252 with an overall average of 213,410 viewers. The ABC, CBS and NBC schedules were mixes of first-runs and repeats while Fox offered two new hours of MasterChef. The highest scorer in that field was CBS’ 7 to 8 p.m. edition of The American Baking Competition, which drew 165,221 viewers opposite that portion of the Rangers game (213,410 viewers). The Rangers also won throughout the night among advertiser-prized 18-to-49-year-olds. Post-Rangers, Fox4’s 9 p.m. local newscast won that hour in both ratings measurements while again improving significantly over a comparatively skimpy lead-in from network programming. The newscast more than doubled its haul of 18-to-49-year-olds over the preceding MasterChef. During daytime hours, CBS’ 1 p.m. hour of The Talk, with CBS11 early morning co-anchor Adrienne Bankert dropping in as a one-day guest host, had 48,189 total viewers to run second in its time slot behind ABC’s General Hospital (75,726 viewers). The Talk also placed second among 18-to-49-year-olds, with CW33’s competing syndicated Maury Povich taking the gold. Bankert brought pecan pie for the group and also got to sit next to guest George Lopez. In Wednesday’s local news derby results, WFAA8 topped the 10 p.m. field in total viewers but Fox4 had the edge with 25-to-54-year-olds (main advertiser target audience for news programming). The 6 a.m. competitions uncommonly were won by two stations other than Fox4. WFAA8 beat NBC5 by a paper-thin margin in total viewers while the Peacock ran first in the 25-to-54 demographic. CBS11 ran the table at 6 p.m.; the 5 p.m. golds were split between NBC5 in total viewers and WFAA8 with 25-to-54-year-olds. Its ratings drooped from a year ago, but NBC’s Season 8 launch of America’s Got Talent still had enough juice to punch out the competition Tuesday night. A preceding live hour of The Voice gave the Peacock a clean sweep in both total D-FW viewers and advertiser-prized 18-to-49-year-olds. Voice drew 247,831 viewers, with 95,682 of them in the 18-to-49 range. AGT, with new judges Heidi Klum and Melanie Brown joining Howard Stern and Howie Mandel, lured 227,179 viewers from 8 to 10 p.m. Its 18-to-49 haul added up to 92,493 viewers. Another talent search, Fox’s So You Think You Can Dance, had the night’s third-best performance among 18-to-49-year-olds, with 51,030 in the 7 to 9 p.m. slot. Over on Fox Sports Southwest, the Texas Rangers’ 17-5 drubbing at Boston sent the Nielsen meter spinning downward. An average of 96,379 viewers witnessed the carnage, including 38,273 in the 18-to-49 demographic. Those are some of the lower numbers of this season. CBS11 nipped WFAA8 at 10 p.m. in total viewers while Fox4 and NBC5 tied for the top spot with 25-to-54-year-olds, the main advertiser target audience for news programming. Fox4 won at 6 a.m. in total viewers, but suffered a very rare loss among 25-to-54-year-olds. NBC5 instead took that gold. The 6 p.m. spoils were split between WFAA8 in total viewers and Fox4 in the 25-to-54 domain. WFAA8 ran the table at 5 p.m.
ABC’s ballyhooed “Man Candy Monday” began in earnest with the addition of Mistresses. Bitter fruit ensued for the new serial soaper. Mistresses drew a low-hanging 123,916 D-FW viewers in the 9 p.m. hour to finish fourth among the Big Four broadcast networks. It also trailed TNT’s timeslot-winning 9 to 10 p.m. portion of the Game 7 Eastern Conference showdown between victorious Miami and gimpy Indiana (337,326 viewers). Mistresses edged a repeat of CBS’ Hawaii Five-0 to run fourth among advertiser-coveted 18-to-49-year-olds. NBC’s The Voice triumphed as usual from 7 to 9 p.m., with 385,515 total viewers and 169,038 in the 18-to-49 demographic. Basketball ran second in both ratings measurements while ABC’s other “Man Candy” entry, The Bachelorette, took the bronzes. Fox had a dismal night, running a distant fifth across the board from 7 to 9 p.m. with repeats of Raising Hope and New Girl, a new episode of Goodwin Games and the broadcast network debut of Charlie Sheen’s Anger Management, which originated on FX. Anger Management drew just 34,421 viewers at 8:30 p.m. before Fox4’s 9 p.m. local newscast showed impressive resilience by pole-vaulting to 158,337 viewers. That’s making a big something out of almost nothing. On KTXD-TV (Ch. 47), D magazine’s D: The Broadcast remained in Death Valley with “hashmarks” (no measurable audience) from 9 to 11 a.m. In contrast, the station’s most-watched attraction, a 2 p.m. rerun of The Big Valley, had 48,189 viewers to beat all competing broadcast network programs except NBC5’s syndicated Steve Harvey (61,958 viewers). Big Valley even showed some pop among 18-to-49-year-olds, drawing 15,947 of ‘em in beating the likes of Fox4’s syndicated Divorce Court, WFAA8’s Anderson Live and CBS11’s The Doctors. CBS11 won in total viewers at 10 p.m. and tied Fox4 for the top spot among 25-to-54-year-olds, the main advertiser target audience for news programming. Fox4 notched another 6 a.m. sweep, with WFAA8 a close second in both measurements. WFAA8 had the most 25-to-54-year-olds at 6 p.m. and tied CBS11 for first place in total viewers. Fox4 ran first with 25-to-54-year-olds at 5 p.m. while sharing the total viewers lead with both NBC5 and WFAA8. This doesn’t sound like much of a number. But it’s pretty huge by HBO’s standards. Sunday night’s penultimate Season 3 episode of Game of Thrones, which ended shockingly, drew 158,337 D-FW viewers in the 8 to 9 p.m. slot. And 98,871 of them were advertiser-prized 18-to-to-year-olds. That’s a thunderous number for a premium pay network whose subscribers add up to 25-to-30 percent of all U.S. TV homes. And it was enough for GOT to win its time slot in competition with prime-time programming on ABC, CBS, NBC and Fox (all of which have basically 100 percent penetration). Only CBS’ 60 Minutes (192,758 total viewers) and Sunday afternoon’s Texas Rangers-Kansas City Royals game on Fox Sports Southwest (185,873 viewers) drew bigger overall crowds than GOT. And the Rangers had the benefit of ratings magnet Yu Darvish on the mound. GOT easily topped all Sunday programming in the 18-to-49 demographic. AMC’s two-hour Season 3 premiere of The Killing drew 34,421 viewers from 7 to 9 p.m. Sunday, with 12,758 of them in the 18-to-49 range. A new 9 p.m. episode of AMC’s Mad Men then bumped up a bit to 41,305 and 22,326 viewers respectively. So game, set match go resoundingly to Game of Thrones among Sunday’s biggest cable entertainment attractions. Saturday afternoon’s Rangers-Royals game averaged 172,105 total viewers on FSS. The most-watched Rangers weekend game was Friday’s on TXA21, which drew 240,947 viewers to lead all prime-time programming. The next most-watched attraction, NBC’s 7 to 9 p.m. edition of Dateline, had 165,221 viewers. The Rangers also had more 18-to-49-year-old viewers than anything else in prime-time, with Dateline again the runner-up. On the extreme downside, Fox’s opening 8 p.m. repeat of The Following, which the network plans to run from start to finish this summer, had a sub-piddling 13,768 total viewers and “hashmarks” (no measurable audience) in the 18-to-49 measurement. So those plans likely will change. CBS11 topped the 10 p.m. competition in total viewers, but WFAA8 ran first among 25-to-54-year-olds, the main advertiser target audience for news programming. Fox4 again ran the table at 6 a.m. and added a 5 p.m. win with 25-to-54-year-olds. NBC5 had the most total viewers at 5 p.m. and the most 25-to-54-year-olds at 6 p.m. WFAA8 led in total viewers at 6 p.m.
CBS11 early morning co-anchor Adrienne Bankert will co-anchor CBS’ The Talk on Wednesday, June 5th. It airs at 1 p.m. in D-FW. Karen Borta, who co-anchors CBS11’s 6 and 10 p.m. newscasts, was a guest host on The Talk in June 2011. ***Former CBS11 reporter Jay Gormley’s short film, Odds Or Evens, is now available on YouTube. It’s definitely worth a look, and here’s a link. Gormley now is director of communications for the Dallas region of Time Warner Cable.